Francis Thyer, a former Deputy Custodian of the Abbey and Julie Hayes, the current Learning Manager, gave two perspectives on the story of the Abbey. They explained how the most recent archaeological discoveries have enhanced our understanding of the development of the site and described their “living history” approach that illuminates the day-to-day life of the Foundation. The Abbey was bought by the Church of England in 1907, having been out of Church hands since the Reformation and Francis gave an excellent description of what remains. This is my summary of that talk – any errors and/or omissions are mine! Lady Chapel built in 1184: The chapel was built immediately after the disastrous fire which consumed much of the abbey in 1184, and was completed by 1186 or 1187. A lot of work has been done in the last few years. Recent conservation work has revealed that around 800 years ago the carvings were painted and highly coloured. Whoever did them took a bit of artistic licence. Jesus, for example, is shown in a 4 poster bed and the 4 wise men are riding on horses. Marks were found in the stone work which supports the view that the west side would have looked like Wells Cathedral. Under the Chapel is a well which has also been revealed and might date back to Roman times. The well is now in the Crypt which was put in during the first part of the 16th Century to accommodate the number of visitors who followed the cult of St Joseph and visited the Chapel. In the vault ribs of the crypt there are numerous holes which probably held the votive offerings made by the pilgrims to the altar of St Joseph. The chapel of St Patrick which was built about 1524, was restored about 15 years ago during which time they found wall paintings under the plaster. It has now been decorated as it was when it was built with representations of various figures and a new stained glass window has been put in. There is also a medieval pond which was enlarged in the 17th century when the canals came through. The Abbots Kitchen was built in 1342 and has been completely restored. Food waste which was recovered on the site has been shown to be of high status food such as sea food which might have come from Uphill or Burnham on Sea. The lantern in the centre of the roof was designed to ventilate the kitchen by drawing in fresh air and expelling smoke through air vents. Peter Brears, a specialist in traditional English cookery, visited the kitchen and suggested how it might be better interpreted. He suggested an arcaded gallery once stretched across the kitchen from the evidence of two stone piers in the north and south walls. Here the head cook may have surveyed the work below and shouted orders to his kitchen staff. At the time it was built all the people working in the kithen would have been men and the chef was probably French, again reflecting the huge wealth and high status of the Abbey. Mason’s marks in the Kitchen have been identified as being of William Joy which dates its building to about 1330 – 1340. 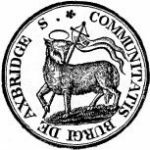 The same mason’s mark has also been found in Wells Cathedral. 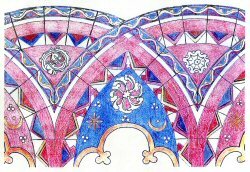 The museum features many of the artefacts found on the site and include the 16th Century Orthery cope which is beautifully decorated and 600 feet long. The length is a measure of the power and status of the Abbey and the cope is second in length to the one in St Peters in Rome. There are also things in Oxford University belonging to the Abbey – a book by Dunstan dating from the C10th, which would have been used as a sort of guide book, and a Gran Tabula of the C13th (6 pages of vellum on wood) in which visitors could read stories of the Abbey and the characters associated with it. Although not much has been found on the site, what has been found has been of high quality reflecting the high status of the Abbey. The pottery, for example, is B2 ware ie high status medieval pottery such as that found at Tintagel and Camelot. Giving some credence to the whole Arthur myth – possibly! Re-apprasial of the archaeology findings: A lot of archaeological work has been done on the site since 1909 but it was never properly catalogued. Due to work done by Reading University this has now all been re-evaluated and collated in a recent book and much of the content is also available online. It has produced some interesting facts. For example there were 5 glass furnaces found under the crypt thought to date back to 680AD which makes them the earliest furnaces in the UK. These would have used to produce window glass as well as glass utensils. All the glass would have been done by skilled craftsmen from the continent – again reflecting the high status nature of the Abbey. The second half of the talk was given by the Learning Manager, Julie Hayes, who came dressed as a pilgrim. Dressed in green, blue and beige, the colours of the poor, she explained the significance of what she wore and carried. Nailed boots, a staff for protection, a useful girdle of rope, hair covered to show she was respectable, a scrip containing a wooden goblet, spoon and also a knife (used for eating). She also had a cloak to keep warm and to wrap around her at night as she would have been sleeping in the open. Julie is part of the Living History team and all the volunteers who take part bring an added dimension to tours of the Abbey. She gave an excellent account of their work which is particularly important in engaging schoolchildren. She also outlined the current project to make digital representations of the Abbey through the ages. 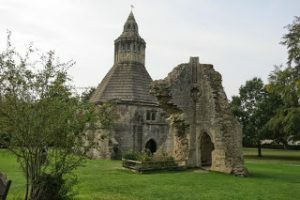 Although somewhat controversial, the project is hoped to attract younger visitors in particular and to illustrate how the Abbey was developed over the centuries. Their next project is to reinstate the medieval kitchen garden which should be well worth a visit when its done.